In which our heroes find themselves with a case of Noranti-induced food poisoning and make an emergency pit stop on an inhospitable volcanic world. Rygel’s treasure finding sense tingles, and he stumbles across a vast trove of someone’s treasure. Naturally, there are traps, thieves, and a neat new technology. For the duration of this episode, I will be referring to Lo’la as the Starbug. The six people on board the Starbug haven’t eaten since Arnessk. They’ve been on the road for a while, so to speak, and there aren’t a whole lot of truck stops in the Uncharted Territories. Not places that without wanted posters, at least. So Noranti, master chef, mashes together some Play-doh. She splits it up, and everyone gets a share. The lesson here is that you should never eat something that the cook has spit in. D’Argo pulls over at a molten rock of a planet because horfing inside the Starbug would be very bad. Mostly for the chain reaction between the occupants, partly for the mess, and definitely for the smell. That never comes out of starship upholstery. Rygel zips off into a cave to evacuate, as his three efficient stomachs have already digested the stuff. Chiana, Crichton, and D’Argo take a minute to chat up Chuck’s sister. Rygel finds valuables in the cave, and is sufficiently distracted that he decides his bowels can wait. Several soccer ball shaped crates containing a variety of valuables lure him into a trap, a laser-activated goo-flinger that rapidly solidifies into an amber-like substance. Very tough stuff. Resistant to pulse fire, and an extremely poor conductor of kinetic and thermal energy. The bad guys have a device that removes it, of course, and they show up post haste. At this point, I have a question. How did they operate the Rygel-muppet in the amber? While he was being carried? I have absolutely no idea, but I’m impressed. The bad guys turn out to have energy shields, nifty harnesses that soak incoming energy weapons fire. They don’t do squat against rocks, though, to our heroes’ benefit. They do work against lava while they’re active, but the device that detects incoming energy fire doesn’t count lava as a threat. These things would be absolutely fantastic in industrial workplaces. Probably not effective against acid, but any place where you have to deal with laser cutting tools or intense heat. Tarkan doesn’t need an energy shield to take a lava bath. Whether it’s armor or physiology, he can hop in the lava and swim around just fine. This has two major implications: First, that he can hop into the lava and pluck out the encased treasure. Second, climactic fight scene in lava! The shot where Crichton submerges to find Rygel and Raa’keel surfaces is fairly awesome. Raa’keel is a terrible boss. There are six bad guys on the planet: One self-immolates at his employer’s command. Two more are shot for losing their shield belts. One more is left to guard Crichton and D’Argo while they’re trapped by laser tripwires and winds up falling into the lava. The head of the mercenary team that Raa’keel hired attempts melee combat against D’Argo and catches an elevator. Raa’keel himself very nearly immolates Crichton by holding him in the lava until his shield goes back into power-save mode, but Chiana arrives in time to keep the shield going, and Crichton knocks him into one of the traps. Suffocation is a bad way to go. Harvey shows up late in the episode, wearing a redundant set of hazmat gear over his coolant suit, to convince Crichton not to hop into the lava. He points out both of the reasons that Rygel should be dead – he’s been immersed in lava, which I’m told is rather warm, and his head has been encased in the amber stuff long enough that he’s likely suffocated. Crichton actually has good reasons why both of those might not be true, closing off two possible plotholes before they can make trouble. Noranti. Oh, man. This episode is her badly-needed… I need a word that isn’t introduction, but more like getting-to-know. Focus, maybe? We’ve seen her running around being nonsensical and drugging Crichton (seriously, she’s been three for three on episodes and hitting him with dust), but now she’s demonstrating other facets. She can dance, for one. Her philosophic principles emphasize the greater good in as peaceful a fashion as possible, though she will use violence when necessary. She falls asleep at inopportune times. She’s reasonably aerodynamic. And she’s very generous with her cleansing purgative. All told, I love her. She’s a fantastically complex character, and she’s fantastic. Sikozu really is brilliant, though her cockiness and superiority complex overshadow her actual smarts. She decodes in an arn what it took D’Argo a month to figure out. Her overconfidence in her own abilities may hurt her, but at least she’ll have people around to help repair the damage. That, and her limbs reattach. In the last few moments of the episode, the Starbug notifies D’Argo that it’s received a message from Pilot of Moya. He sent rendezvous coordinates. Next episode, the band will be back together. Hooray! …now let’s see how everything goes to Hezmana in a handbasket. One of the things Farscape seems to really like to do (and more often than not does very well) is to play with expectations. We get presented with a situation, make assumptions based on the little we’re given, only to find out we were wrong in some way by the end about what we thought was going on. This can be clumsy when it’s not implemented well, either by feeling too obvious so that we catch on before we’re supposed to, or by being so out of nowhere that it feels like it’s a twist for the sake of a twist. 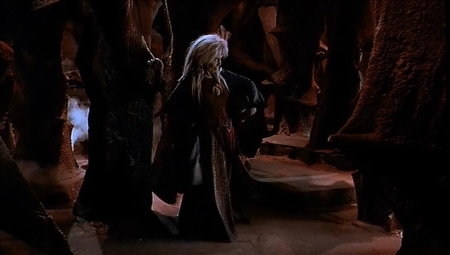 But most of the time, Farscape seems to use this plot device really effectively. In this most recent example, we have the Grand Moff Tarkans. We get told initially that they’re a peaceful race that has done great works throughout the galaxy. Because it comes from Nana Peepers, we aren’t entirely certain whether or not to buy into this explanation, and because of the situation, it’s pretty easy to come to the conclusion that either her telling of things isn’t accurate at all, or that these aren’t actually the Tarkans we’re dealing with. And then we meet Raa’Keel, who seems to act just as nasty as he looks. I’m not sure about anyone else’s reactions, but at that point, it seemed to me that we either weren’t dealing with the Tarkans at all, or the rest of the bandit gang were the Tarkans, who had either turned traitor or were being forced to help Raa’Keel. Of course, the real twist sets in at the end, when the Tarkans actually do show up, and we find out that no, Raa’Keel really was the Tarkan of the group, just a seemingly rare case of a very bad apple amongst the allegedly benevolent race. It was a well layered subversion of what the situation appeared to be initially, and took me completely by surprise. We get more of Noranti and Sikozu being… themselves. Noranti definitely means well, but seems to act almost completely on her own, regardless of what the others think or even if it’s counteractive out downright dangerous to what they’re trying to do. It would almost be on the level of Stark or Jool in regards to “why are they keeping this person around” (and considering John and D’Argo both talk pretty openly about wanting to be rid of her, the thought is definitely crossing their minds), except for the fact that she does actually know what she’s talking about (at least, most of the time), and when she needs to produce results, she comes through. Sometimes with hilarious results that require a bucket of brain bleach. Sikozu, on the other hand, continues to push her attitude of intellectual superiority on the group, much to Chiana’s annoyance. I love that she’s basically incredibly book-smart, but falls short on the side of actual experience, which the rest of the crew has in spades at this point. As a result, it seems like she’s often right in theory but less so in the actual execution of her ideas. She’s almost an inversion of the problems inherent with Noranti – where Noranti has years of experienced knowledge and “wise old woman” type wisdom, she seems to totally lack common sense. Meanwhile Sikozu is fairly grounded in reality, but comes up slightly short sighted because she’s so by-the-book in her methods. In this episode she manages to find a (rather gross) way to activate and work D’Argo’s ship, and attempts to work out the details of how to make it shoot its cannon. She convinces herself that she has the right controls worked out, only to have it fail at the last second. When Chiana mocks her, she smacks a random button in frustration, which of course actually does fire the cannon. At the end of everything, we learn that Pilot and Moya have heard their calls, and are finally coming to pick them up. The look on everyone’s face (save for Noranti and Sikozu, of course) says it very plainly. They’re going home. We’ve come across different ways that reputations have gotten Our Heroes into trouble. Usually it’s Crichton doing it, in wonderful examples of Crichton’s Law (“Anything bad that could happen, does, specifically because Crichton is involved”). Noranti Nana Peepers seems to be particularly susceptible to it. She stayed on Moya from the strength of Crichton’s reputation as a thorn in the side to Peacekeepers (and anyone who thwarts their plans on a regular basis has to be good people, natch), and she fervently believes that this cache of treasure belongs to the Greatest Freedom Fighters In The Galaxy. It is interestingly subverted, as Weston and Tessa pointed out, that she is absolutely correct, even though the people stealing it aren’t said Freedom Fighters. Nana Peepers continues to be confusing, infuriating, and a little bit eldritch, and I’m loving every moment of it. She’s the ready-made roadblock in Crichton And Company’s life, tripping them up in every way possible while still being useful enough to help them do the right thing. Her motives are still muddled, but we’re getting a broad sense of what they seem to be, at least: a kind of non-specific Generically Good Deeds For The Universe. Having not been able to see most of these episodes first-run, I honestly don’t know if this gets explained later on, and I’m really hoping that it doesn’t. Guinan, for example, was one of Star Trek‘s greatest unexplained phenomena, and I love that even though they gave her a race, history, and kept revealing more about who she was, they never explained what made her so mysterious, and why she and Picard entered into one of Sci-Fi’s greatest Bromances of all time. Basically, as long as Nana Peepers continues to be delightfully frustrating yet a quantifiable force of Good, I’m happy. I really think that this episode served mostly as a vehicle to solidify her role in Our Heroes, and set the tone for her normal interactions. Sure, there was the sort-of truce between Sikozu and Chiana that developed, and the wacky antics of D’Argo, Rygel, and Shemp Crichton, but it really was Noranti’s spotlight – and like Nana Peepers herself, the spotlight was subtle, obfuscated in other zaniness, and shifted noticably towards the Light. I got a bit teary-eyed when Pilot’s voice came on the comm. Manly tears of joy, that’s what they were. I can ignore that, however, based on the awesome terrifying moments of the shield device powering down while he was wading through it. Once again, Farscape, I can ignore how science actually works because because you totally brought it. Really subtle callback to D’Argo’s dismay at Crichton puking in front of him. Anthony Simcoe is the king of physical comedy. It’s late at night, I’m wrapping the piece up this week, and I’m having about as hard of a time pushing thoughts onto the page as Rygel did pushing his diarhettic eruption through a solid layer of amber. This episode is pure filler, something to keep our heroes busy for an episode, but it’s good filler. It’s an entertaining story of highly respected freedom fighters and the outcast looking to swipe a treasure out from under their noses. They have nothing to do with our heroes, our heroes have no reason to be on this planet but an emergency bathroom break, so what follows is a light cat-n-mouse adventures where Crichton and D’Argo bicker, Rygel farts a lot, Sikozu and Chiana shove their hands in vomit, and Noranti gets nekkid. I’m with Kevin in finding all the science a bit iffy. I’ll give them the bit near the end of Crichton tricking the shield into letting him wade through lava, but our characters would have passed out quickly surrounded by this much molten rock, and the winces D’Argo and Crichton make when tortured with a bit of lava spatter should have been screams from third-degree burns as the lava ate deep into their tissue before cooling. I love the design and execution of Raa’Keel. The way he moves, his sleek bulk, the focus on his mouth, the way he’s equally chilling with the eyeless helmet or his own insect eyes and exposed brain beneath. He’s gruesomely beautiful and instantly brought to mind the world of the Hellboy movies. On a less successful makeup note, the really bad bald caps and comical patches of hair on Raa’Keel’s goons. Noranti is an incredibly frustrating person. She doesn’t care much about or respect anyone else on board. She seems to be living in her own world. Every time she helps, she also hurts. Even when she does bring in the cavalry, it’s too late as the others have already resolved the situation. The entire crew would be far better off without her. In other words, perfect addition to the cast. That’s… about all I can manage. It’s a good episode. Nothing essential, but Farscape filler is still often better than most.